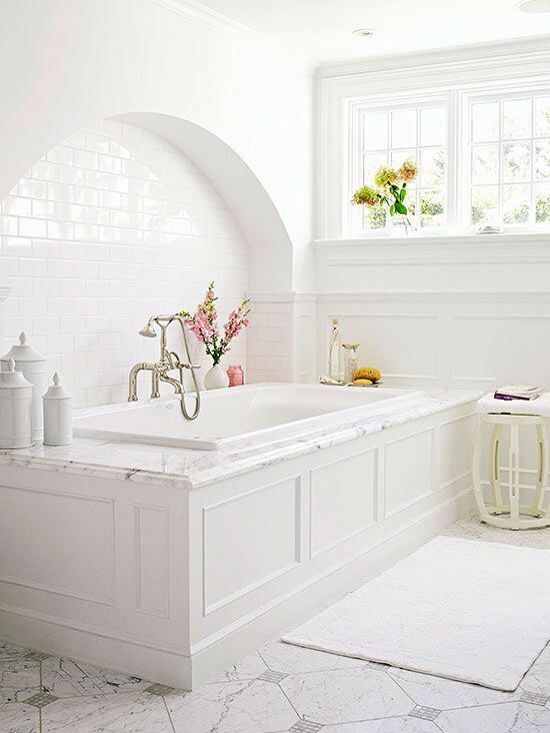 whether you’re a novice or a seasoned professional, a bath remodel or build is a stressful and complex af process. regardless of experience, many little details can often go overlooked, and can ultimately make or break the overall success of your project if done incorrectly. before settling for something in your new project that you’ll accept just because it fits the status quo, take a moment to consider a few points and fixtures that aren’t generally given much consideration. 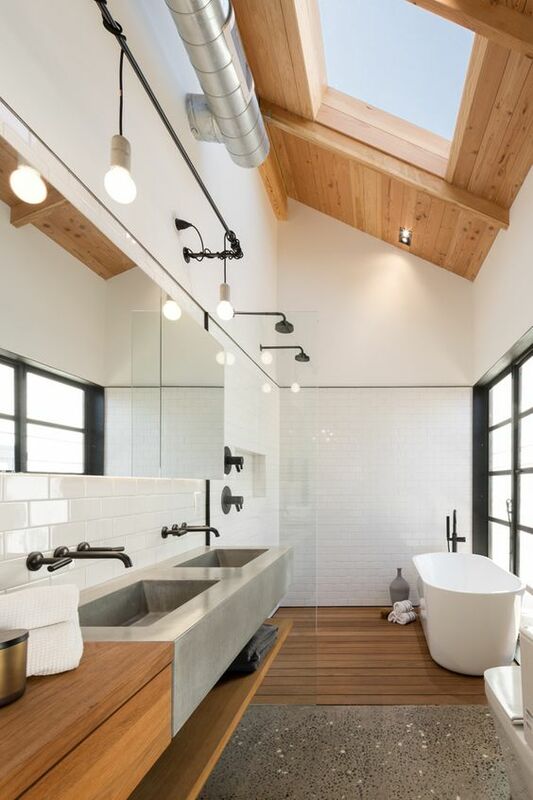 I love the look of a freestanding tub as much as the next designer, interiors enthusiast, and bather. they make a stunning stand-alone statement in virtually any design style: classically vintage, contemporary, effortlessly transitional - you name it. however, as stunning as they are, I’m finding myself drawn to drop-in & undermount tubs more and more. these tubs have gotten a rap for being ugly, dated, and a general eyesore in a bathroom, but in modern design, that couldn’t be further from the truth. in an an under mount or drop-in configuration, you have the opportunity for a bespoke tub deck & apron (picture: a slab of exotic marble), and the footprint creates the perfect space for built-in shelving in nearly any sized space. in regards to functionality, freestanding tubs are great for aesthetics, but are far from practical. there are few freestanding tubs that offer hydrotherapy options, and the ones that do are acrylic (also few and far between). with a freestanding a soaker tub, you’ll be sitting in a pool of water that will turn to freezing within a few minutes. while whirlpool tubs are over & done, drop-in and under mount tubs have air-bubble jet options (small holes that don’t require cleaning) that recirculate hot water during your bath, meaning your water will never get cold. with an inline back heater you could stay in a bath for days! if you’re looking for a spa-type bath, you need hydrotherapies. consider bain ultra or kohler for those. drop in and under mount tubs offer deep, aesthetic, functional bathing experiences, with ledge/deck support that you aren’t likely to slip and die trying to get out of whilst slippery wet. in short, they’re the best of both the design and spa worlds. the days of that awkward 4” stone slab behind your sink are well on their way out! backsplashes, though still a necessity, aren’t being taken so literally anymore - hallelujah. instead, consider the extremely popular trend of tiling your entire wall, or up to a certain height (48”) if that better fits your fancy. you’ll make a fabulous design statement, and avoid having to live with a backsplash that’s dated itself even prior to install. 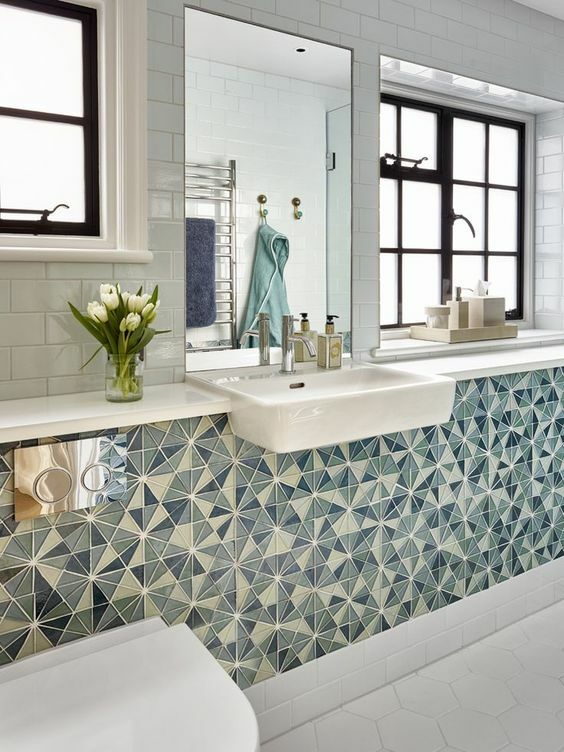 tiled walls are especially fantastic alternatives to backsplashes in small baths and powder rooms, as they’ll give you as much as an extra inch of vanity depth. it may not sound like much, but when you’ve only got a few inches to work with, that space could be the difference having to opt for a pedestal over a vanity. I always hear about niches being these fabulous opportunities to incorporate a bit of accent tile into your shower or bathing area and a great way to add in storage, and I’m as guilty of this as any. however, I’ve recently conceded to the notion that niches are one of the most impractical fixtures you can build into a bath. it’s hardly ever a consideration that bottles, razors, and other unsightly showering items will be covering that beautiful recessed mosaic tile, and that water is extremely prone to pooling in the corners, making them highly susceptible to limescale, rust, mold, and overall grossness. often times, people don’t want their niche to be too large or overbearing so they’ll make it just a tiny 12x12 hole, which they’ll find out only too late is useless if you have a tall bottle, or something with a pump mechanism. idea we LOVE: build out a half wall to use as a ledge, instead of a niche. break up the wall with two configurations or styles of tile. you won’t have to worry about bottles or size constraints. we are obsessed!! instead of a niche, consider opting for an accent wall of just tile, and build a bench to put your bottles and personal items on. the accent tile will be much more of a focal point, unobscured by consumer goods, and won’t become a cesspool. the open shelving movement is thriving right now, and everyone seems to be tearing down their linen storage and replacing them with a reclaimed shelf or two. I don’t necessarily blame them considering the joanna gaines effect. however, maybe done in diy-pinterest-project haste, you didn’t consider that removing your closets for open shelving means that all of your neatly (or not-so-neatly) stored-away goods will be out on display, and there’s just that much more opportunity for clutter. unfortunately, these good looking shelves don’t offer any help to those (everyone) with that critical cupboard that houses all those odds and ends that you never think you’ll use but always do, just before you throw them out. we say, stick with the built-ins. tower vanities, particularly the cabinets dividing an 8’+ long vanity in the center, are something nearly as purposeless as open shelving. if you have an 8’+ vanity, it’s unlikely you’re short on space, first of all. secondly, how practical is it to have something stored on a 7’ high shelf, that you’ll never be able to reach? your bath will feel much more open if you leave the towers out. medicine cabinets + your vanity bases can more than store enough. these are just place holders that will close off your design and up your cost. we’re not a huuuuge fan of lap drawers, but when the setting’s right, they can be magical. if you’ve got the space to use and it would be a practical addition for you, go for it! all too often I work with someone who has their mind set on double sinks only because “that’s what a master bathroom is.” in all practicality, do you + your spouse each need your own sink? unless you find yourselves running into each other in the bathroom at the exact same time, there’s quite literally no need for the both of you to have a sink. separate drawers and doors, sure. but a 72” vanity with a single sink - say it with me - is okay. 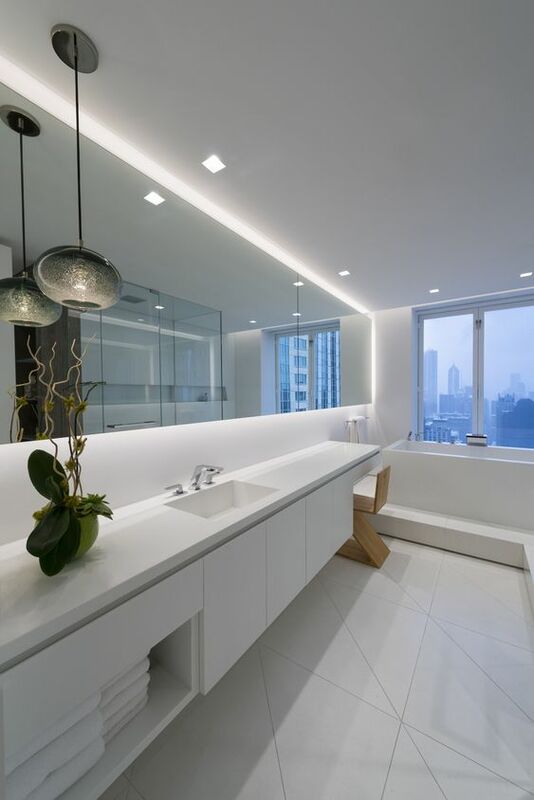 think of all the vanity space you’ll save, which is much more valuable than sink space. absolutely consider upgrading to a single, higher end faucet and single sink if that’s a practical measure for you. too attached to the idea of double sinks to give it up? try a trough-sized single sink with dual faucets for a unique look that adds a one-of-a-kind touch, without completely sacrificing the idea of having a second sink. just as I can’t (hypothetically) do my own taxes, some people can’t spatially visualize or design in their minds or 2d. as a general rule, just because your floorplan is symmetrical, it won’t necessarily translate into a fluid or logical space once brought to fruition. just as it can be difficult to visualize a space from a 2d floorplan, it’s equally (if not more) difficult to visualize a 3d space’s 2d floorplan. if you’re the typical (type a) non-trade consumer with architect plans looking for some guidance, consider letting up on symmetry and focus on the flow and practicality of the room. visualization is difficult for some, but that’s what the pros are for! speaking of pros…anyone up for doing my taxes? have you ever run into issues with any of these? how did you resolve them? sound off below!